1 The Research Problem: What Motivates the Voters of the Extreme Right? The so-called “third wave” of post-war right-wing extremism (Beyme 1988) in Western Europe caught comparative political science by surprise. After the Second World War, the Extreme Right in Western Europe had been associated with the atrocities of the Nazis and their puppet regimes (Rydgren 2005) and was therefore politically isolated and insignificant in most countries of the region. But from the early 1980s on, parties that were dubbed as “Extremist”, “Radical”, “Populist” or “New” Right or any combination thereof1 and had been located at the margins of the political systems suddenly proved highly successful at the polls in countries such as Austria, Belgium, Denmark, France, Italy, Norway, and Sweden. The diversity of these parties looked somewhat bewildering. Some had rather obvious connections with the old inter-war right while others qualified as “modern” (Ignazi 2002). Two of them pursued a separatist agenda (the Vlaams Blok and the Lega Nord) whereas the majority was firmly committed to national unity, and some of them had been founded as early as in the 1940s (the Italian MSI) whereas others (most notably New Democracy in Sweden) were only formed shortly before their first electoral successes. There is less agreement, however, as to what motivates the voters of the Extreme Right. In many of the earlier accounts, the notion of a (pure) “protest vote” features prominently. While there is no universally accepted definition of what constitutes a protest vote (but see Kang 2004), this literature suggests that protest reflects an unsatisfactory performance of the political system. Protest is therefore disconnected from ideology and should primarily be understood as “a vote against things” (Mayer and Perrineau 1992: 134). In a similar fashion, van der Brug and Fennema (2007: 478-479) argue that “the prime motive behind a protest vote is to show discontent with the political elite”, whereas political attitudes would be of less importance. This interpretation fits neatly into the discourse on anti-party sentiment that gained prominence in the early 1990s (Poguntke and Scarrow 1996), and there can be little doubt that at least some of the Extreme Right parties could benefit from widespread feelings of distrust and disaffection with the established parties. The more recent literature, however, acknowledges that quite often, protest is not un-ideological at all but clearly directed “against the policy or the absence of policy in this respect [imigration and safety]” (Swyngedouw 2001: 218-219). Consequentially, the vast majority of comparative studies of the Extreme Right vote now adopt a theoretical framework that is based on the notion of a conflict between non-Western immigrants and the indigenous population over scarce resources (jobs, welfare benefits). Prominent examples of this approach include Jackman and Volpert (1996), Knigge (1998), Lubbers et al. (2002), Golder (2003a), and Arzheimer and Carter (2006), who all analyse the joint impact of immigration and unemployment on the electoral returns for the Extreme Right. More recently, Swank and Betz (2003) and Arzheimer (2008) have introduced the level of welfare benefits as an additional mediating variable. Given the findings from this literature and the importance that the issue of immigration has gained for the parties of the Extreme Right, it makes obvious sense to assume that the voters of the Extreme Right are primarily motivated by concerns about immigration. Due to data restrictions, however, there is surprisingly little empirical evidence to support this view. The four studies by Jackman and Volpert, Knigge, Golder, and Swank and Betz are based on polity-level data alone and therefore have to take the anti-immigrant sentiment of the Extreme Right voters for granted. But even those comparative analyses that employ micro-data either assume a link between anti-immigrant sentiment and the Extreme Right vote or do have to rely on sub-optimal indicators. Arzheimer and Carter (2006), for instance, present a hybrid model of Extreme Right voting that combines variables measured at the micro-level with information on the polity-level to capture the effects of “Political Opportunity Structures” on the individual vote. But this model does not include any items on individual political attitudes because the national election surveys on which their analysis is based “do not provide adequate data on attitudes” (Arzheimer and Carter 2006: 425). Rather, Arzheimer and Carter treat socio-demographic indicators like age, gender, and formal education as proxies for political preferences and values that might or might not dispose a respondent to vote for the Extreme Right (Arzheimer and Carter 2006: 421-422). In a similar fashion, Lubbers et al. (2002: 357) estimate a complex multi-level model of Extreme Right voting. But because they use various data sources, they have to rely on single measure for anti-immigrant sentiment that is common to these data-sets, namely the question whether the respondents feels that “there are too many immigrants” in the country. While this is obviously a much more direct approach to the alleged link between anti-immigrant sentiment and the Extreme Right vote, operationalising a complex phenomenon like anti-immigrant sentiment with a single indicator is risky because this variable will be subject to both systematic and random measurement error. Likewise, even the useful study by van der Brug and Fennema (2003) that focuses exclusively on the question of whether the vote for the Extreme Right should be considered a “protest vote” relies on a single indicator to assess the impact of anti-immigrant sentiment on the Extreme Right vote, namely the subjective importance and satisfaction with immigration policies. While anti-immigrant sentiment and (to a lesser degree) notions of “pure protest” dominate the recent discussion, two early but very influential accounts of the the “third wave” provided a rather different explanation for the success of the Extreme Right. Both Betz (1994) and Kitschelt (1995) claim that economic (neo-)liberalism is the key ingredient in the Extreme Right’s electoral “winning formula” (Kitschelt 1995: viii). According to them, “modern” parties like the Freedom Party in Austria or the Front National in France are enormously successful because they mix xenophobic statements with an attack on high taxation, the welfare state and its bureaucracy. Such a program would appeal to working class and lower middle class voters who feel that they do not benefit from “big government” but are likely to suffer from comparative disadvantages in a globalising labour market. More “traditional” Extreme Right parties like the German DVU and Republikaner, however, would never attract a similarly large constituency because they were wedded to the welfare policies of the inter- and postwar Extreme Right. With the benefit of hindsight, the Extreme Right’s involvement with neo-liberal policies during the early 1990s now looks more like a brief fling. Consequentially, Betz (2003) has altoghether abandoned the idea that the Extreme Right does seriously pursue a “neo-liberal” agenda or has done so in the past, while Kitschelt has modified his original ideas considerably (McGann and Kitschelt 2005). Given the professional stature of both authors and the impact their respective monographs had on the field, an empirical test of the “winning formula” thesis is, however, overdue. To summarise, while anti-immigrant sentiment has emerged as the most prominent motivation behind the Extreme Right vote in Western Europe, alternative accounts do exist and adequate tests of the respective causal links have by and large been restricted to a host of national studies (e.g. Billiet and Witte 1995; Clark and Legge 1997; Mughan and Paxton 2006). This is obviously problematic because each of these studies uses a different set of indicators, thereby rendering comparisons over time and countries invalid. Fortunately, comparable data on attitudes towards immigrant as well as on electoral behaviour have recently become available with the first round of the European Social Survey (ESS). The aim of this article is therefore to make use of these data for modelling the effect of protest, immigrant sentiment and economic liberalism on the Extreme Right vote while at the same time controlling for a larger number of background variables than previous studies. Figure 1 represents the basic structure of the model. “Vote” is a dummy variable that takes the value of 1 if a respondent has voted for a party of the Extreme Right (see footnote 1) and the value of 0 if he or she has abstained or voted for another party. Vote is regressed on a a number of control variables as well as on the standard indicator (Arzheimer 2002) for non-ideological protest motives (“And on the whole, how satisfied are you with the way democracy works in this country?”), on sentiment towards immigrants, and on economic liberalism, thereby providing a direct test for the three most popular hypotheses about the motives or Extreme Right voters. Jobs Would you say that people who come to live here generally take jobs away from workers in [country], or generally help to create new jobs? Social Security Most people who come to live here work and pay taxes. They also use health and welfare services. On balance, do you think people who come here take out more than they put in or put in more than they take out? Economy Would you say it is generally bad or good for [country]’s economy that people come to live here from other countries? Cultural Threat Would you say that [country]’s cultural life is generally undermined or enriched by people coming to live here from other countries? Quality of Life Is [country] made a worse or a better place to live by people coming to live here from other countries? Crime Are [country]’s crime problems made worse or better by people coming to live here from other countries? Scales for “Wages”, “Skilled Labour”, “Labour Migration”, “Multi-Culturalism”, “Religious Diversity”, “Linguistic Diversity”, “Immigration” and “Fair Share’ run from 1 (“Agree Strongly”) to 5 (“Disagree Strongly”). All other scales run from 1 to 11. Where necessary, scales were reversed so that high values refer to the pro-immigrant position. In the literature, immigrant sentiment is often portrayed as a complex phenomenon (Mughan and Paxton 2006). Moreover, given the different levels and patterns of immigration in Wester Europe, one cannot take for granted that interviewees from different countries respond to any given indicator in exactly the same way. Therefore, immigrant sentiment is conceptualised as a “latent” (not directly observable) variable in the model.5 Having a separate measurement model for this attitude makes the overall model more robust and allows one to assess the reliability of the indicators in comparative perspective. The 15 indicators selected for the measurement of anti-immigrant attitudes (see Table 1) reflect two major components of anti-immigrant sentiment, namely perceptions of material and cultural threats. However, while these two sub-dimensions are conceptually separable (Mughan and Paxton 2006: 342-343), the respective items display a very high degree of intercorrelation in all countries under study and are therefore interpreted as indicators for a single latent variable. 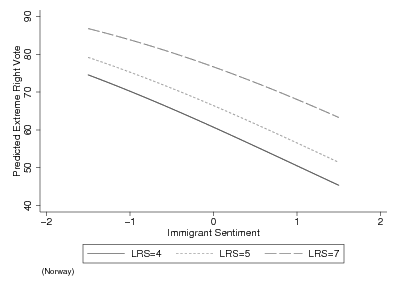 To ease the interpretation, items were rescaled so that positive values of the latent variable correspondent to pro-immigrant sentiment whereas negative values stand for anti-immigrant sentiment. For “Government Intervention”, the scale was reversed so that high values refer to the economically liberal position, too. To test Betz’s and Kitschelt’s early hypothesis about the importance of pro-market attitudes for the Extreme Right vote, the model contains a second latent variable dubbed “Economic Liberalism”. It is constructed from three indicators that capture resistance against equalisation of incomes, against trade unions and against state intervention in the economy (see Table 2). As outlined above, socio-demographic variables often play an important role as proxy variables for attitudes in the existing research on the Extreme Right because theory suggests various causal links between both groups of variables. For instance, ethnic competition theory suggests that higher levels of formal education should be associated with lower levels of anti-immigrant sentiment (because most non-Western migrants are unskilled) and therefore with a lower propensity to vote for the Extreme Right. Moreover, there is ample evidence that formal education promotes liberal values (e.g. Weakliem 2002), whose adoption should also reduce levels of anti-immigrant sentiment. Either way, once anti-immigrant sentiment is controlled for, socio-demographic variables should have only minimal direct effects on the vote. Again, most existing research simply assumes that socio-demographics can be used as a proxy variables for anti-immigrant sentiment, precisely because good indicators for attitudes are not generally available. To test this assertion as well as to control for residual effects, the model contains a large selection of socio-demographic variables (gender, age, union membership, church attendance, class6, employment status, education7, household size, and relationship status8) that have been shown to have an effect on the Extreme Right vote in previous research. Both direct and indirect (via anti-immigrant sentiment and economic liberalism) effects link these variables and the vote. Finally, it has been noted that the literature on the voters of the Extreme Right is empirically and analytically not well connected to the very large body of research on mainstream electoral behaviour (Arzheimer 2008). In a bid to overcome this unfortunate divide, two standard attitudinal measures were included in the model as additional controls: according to the Michigan school, party identification9 is the single most important predictor of electoral behaviour, whereas ideology (left-right self placement) plays a prominent role in spatial approaches to electoral behaviour that build on the work of Hotelling (1929) and Downs (1957). Not controlling for these important predictors could lead to significant bias in the results. The presence of latent variables and the (block-causal)10 structure of the model call for Structural Equation Modelling (Kaplan 2000), a statistical technique that allows one to estimate the parameters for the relationships between several variables simultaneously. Estimation was carried out on a per-country basis so that the sign and strength of effects can be compared across polities. Second, while levels of item non-response are generally very low in the ESS, even a small proportion of missing values adds up in a model with so many variables. To avoid bias, over-optimistic standard errors and the massive reduction of the sample size that would result from listwise deletion (i.e. complete case analysis), Multiple Imputation by Chained Equations (MICE, see van Buuren and Oudshoorn 1999) was applied to fill the gaps in the data with a range of plausible values. For each country, 21 separate imputations of the original data were created using Royston’s (2005) implementation of MICE in Stata. Since MICE is a stochastic procedure, the differences between these imputations reflect the uncertainty about the missing values. Results from the 21 separate analyses were then combined in Mplus according to the rules outlined in Rubin (1987). This somewhat complex procedure yields approximately unbiased parameter estimates and conservative standard errors that take the amount of missing data into account, thereby providing an additional margin of safety. Finally, an (arbitrary) scale for the two latent variables (immigrant sentiment and economic liberalism) must be established to identify the model. This was done by assuming that these variables are standardised, i.e. that they have a mean of zero and unit variance. Amongst the many fit indices for Structural Equation Models that have been proposed in the literature, the Root Mean Squared Error of Approximation (RMSEA) is arguably the most popular at the moment because it has a well-known distribution and is less sensitive to the size of the sample than other measures (Garson 2008). Table 3 shows that in all seven countries, the RMSEA is well below the conventional threshold of 0.1 and actually comes very close to the value of 0.05, which indicates a very good fit. Estimates for the measurement model for immigrant sentiment are equally encouraging (Table 4). All coefficients are statistically significant12 and have the correct sign. Moreover, for most indicators the parameters are roughly within the same range, implying that the respective indicators are more or less equivalent. Since the entries in Table 4 are really just unstandardised regression coefficients, their interpretation is straightforward. For instance, the last of the 15 items asks whether the respondent agrees that the country gets a “fair share” of refugees. 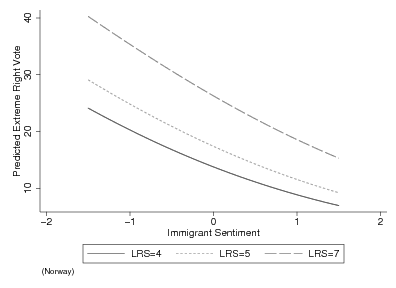 If one now compares two respondents with average (0) and rather positive (1) feelings towards immigrants, this difference of one standard deviation on the latent variable results in a substantively higher (about 0.5 points on a five-point rating scale) level of agreement with the pro-refugee statement, with the strongest effect (0.558 points) in Austria and the weakest (0.316 points) in Italy. The measurement model for economic liberalism (Table 5), however, works less well. More specifically, the item on government interventions is only loosely connected to the latent variable13 whereas the two other items perform well. This is probably due to an extremely skewed distribution of the responses: in all countries but Austria, majorities in excess of 70 per cent either support government interventions or are at least indifferent. However, since scepticism about government interventions obviously reflects the theoretical content of economic liberalism, the item was retained. Entries are unstandardised regression coefficients (WLSMV) based on 21 imputations. Standard errors in parentheses. Table 6 presents the coefficients for the regression of economic liberalism on a range of socio-demographic control variables. Rather unsurprisingly, the unemployed, trade unionists, and members of the working class show substantively lower levels of economic liberalism than other respondents. Conversely, interviewees holding university degrees show disproportionate support for market capitalism. However, the relative and absolute strength of these effects varies considerably. In France, for instance, education is the key factor, whereas class and trade union membership are dominant in Denmark or Austria. Moreover, gender makes a significant difference in all countries but Italy: even if a whole host of other socio-demographics is controlled for, men tend to support market mechanisms more strongly than women. As discussed in sections 1 and 2, most comparative analyses of the extreme right vote in Western Europe rely on a putative link between socio-demographic indicators of group-membership on the one hand and anti-immigrant sentiment on the other. Table 7 demonstrates that this practice is justified, at least up to a degree: formal education emerges clearly as the single most important predictor of sentiment towards immigrants. In all seven countries studied here, respondents with a university degree report much more positive feelings towards immigrants than other interviewees. The difference is roughly equivalent to half a standard deviation of the latent variable and varies from 0.48 points in the Netherlands to 0.69 points in Austria. Moreover, even though education is controlled for, class has an effect, too: in most countries, members of the working class and the “petty bourgeoisie” display a much more negative attitude towards immigrants than other respondents. Other variables (unemployment in particular) have smaller and more erratic effects. Finally, Tables 8 and 9 presents the (probit) regression of the Extreme Right vote on socio-demographic and attitudinal variables. A first important finding is that once attitudinal variables are controlled for, in all of the seven countries socio-demographic variables have no significant effect on the vote whatsoever. Put differently, the large and persistent differences as regards the propensity of various social groups to vote for the Extreme Right that have been observed in national and comparative studies are entirely due to differences between these groups with respect to the five attitudinal variables included in the model. As regards the protest motives, the effect of satisfaction with the way democracy works in one’s country is statistically insignificant in most countries. Only in Belgium and the Netherlands, there is a link between (dis)satisfaction and the Extreme Right vote. While the absolute value of the coefficient is small (-0.14 and -0.12 respectively), its potential impact is large because satisfaction was measured on a ten-point rating scale. However, the interquartile range for satisfaction in Belgium and the Netherlands (loosely speaking the difference between those who are fairly dissatisfied and those who are fairly satisfied) amounts to only 3 and 2 points respectively, which would result in a rather moderate impact on the likelihood of an Extreme Right vote. On balance, these results suggest that the role of “pure protest” motives is very limited. Similarly, economic liberalism is obviously not a key ingredient in the electoral winning formula for the Extreme Right: its effects are insignificant in all countries. Crucially, the effect is negative (though statistically insignificant) for the voters of the French Front National, Kitschelt’s 1995 “master case” of a “new” rightist party. On the other hand, positive sentiment towards immigrants generally exerts a significant negative effect on the vote. Put differently, concerns about immigrants and immigration policies emerge as major motivation for the voters of the Extreme Right in six out of seven countries. The single exception is Italy, where the effect is not significantly different from zero. This specific finding sheds an interesting light on the Alleanza Nazionale, whose supporters make up the vast majority14 of the Italian Extreme Right voters in the data set: first, even the Alleanza’s neo-fascist predecessor party MSI displayed only very limited hostility to foreigners (Newell 2000), and second, the party has moderated its profile so much in recent years that some scholars do not longer consider it as part of the Extreme Right. While one can obviously not judge a party by its voters, the results demonstrate that the Alleanza’s supporters are different in so far as they are apparently not particularly attracted by anti-immigrant rhetoric and policies. Rather, they seem to be motivated by their general left-right preferences and their identification with the party. As regards ideology, the findings are similarly clear-cut: more right-leaning respondents are far more likely to vote for the extreme right even after immigrant sentiment is controlled for in all countries but Denmark and France, where the effect does not pass the conventional threshold of statistical significance. Again, this speaks against the idea that the voters of the Extreme Right are motivated by pure protest motives which are unrelated to policy considerations. Finally, party identifications have a very strong and highly plausible effect on the Extreme Right vote: respondents who identify with these parties display a very high propensity to vote for them, whereas an identification with any other party acts as an effective deterrent. While this may seem fairly obvious (if not tautological), almost all existing analyses neglects the role of party identification. This is problematic precisely because party identification has such a strong effect on the vote. If this force is ignored, severe bias can result. Also, like with other parties, the match between party identification and voting behaviour is by no means perfect. The share of identifiers amongst the voters of the Extreme Right varies between 25 (Netherlands) and 67 (Italy) per cent, whereas between 54 (France) and 85 (Italy) per cent of the identifiers vote for the respective party. This important role of party identification provides additional evidence against the pure protest hypothesis. 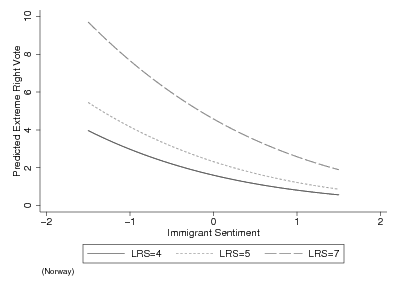 Moreover, only when this strong yet imperfect link is controlled for, one can truly appreciate the importance the influence of immigrant sentiment and ideology: although the single most important predictor of the Extreme Right vote is statistically held constant, policy-related attitudes still exert a very strong influence. Entries are unstandardised Probit regression coefficients (WLSMV) based on 21 imputations. Standard errors in parentheses. From Figures 2, it is readily apparent that both ideology and immigrant sentiment have a sizeable impact amongst non-partisans: for a right-leaning voter who dislikes immigrants, the probability of a vote for the Freedom Party quickly approaches 40 per cent, while this probability is 20 per cent or less for left-leaning voters, especially if they are favourably disposed towards immigrants.17 But even amongst those respondents who identify with the Freedom Party (see Figure 3), the probability of an Extreme Right vote is clearly less than 100 per cent and varies considerably with ideology and immigrant sentiment (Figure 3).18 Perhaps the most interesting constellation is depicted in Figure 4. Here, one can see that even respondents who identify with another party have a sizeable probability of voting for the Freedom Party, provided that they are right-leaning and strongly oppose immigration (cf. the upper-left corner of the graph). While such a vote would still be a rather rare event, the probability of an Extreme Right vote is considerably (i.e. roughly ten times) higher in this group than amongst those respondents who have a more favourable attitude towards immigrants (cf. the lower-right corner of the graph). Entries are ratios of the expected vote shares amongst anti-immigrant (-1) and pro-immigrant (+1) centrist (5) citizens with no party identification. The (mostly insignificant) effects of all other variables were set to zero. Further graphical comparisons between countries are hampered by the fact that the base level of Extreme Right support (as reflected by the constant in Tables 8 and 9) varies considerably, resulting in essentially flat lines for countries with low levels of Extreme Right support. Therefore, ratios of predicted vote shares were calculated to put the impact of immigrant sentiment into comparative perspective. These calculations focus on a group that is of particular interest for political strategists in all West European countries: centrist citizens who are not attached to a particular party. In Norway, for instance, members of this group who display a rather positive (+1)19 attitude towards immigrants have a probability of roughly 12 per cent to vote for the Freedom Party. But for members of the same group who clearly dislike immigrants (-1 on the scale), the probability of a Freedom Party more than doubles. As can be gleaned from Table 10, for most countries this ratio is roughly in the same range. The obvious exception is Italy, were immigrant sentiment makes virtually no difference as regards the electoral prospects of the Extreme Right.20 On the other hand, in Austria and Denmark support for the Extreme Right roughly triples with increasing anti-immigrant sentiment. While this figure might be slightly misleading in the case of Austria because support for the Freedom Party was generally very low amongst centrist independents so that the political impact of immigrant sentiment must remain limited within this group, attitudes vis-a-vis immigrants make all the difference in Denmark. Here, even those independent centrists who hold favourable views of immigrants have a seven per cent probability of voting for the Extreme Right. Consequentially, the model predicts that about one in five independents who strongly dislike immigrants but have otherwise centrist political preferences will vote for the Extreme Right. Parties of the “Extreme”, “Radical” or ‘Populist” Right have become a permanent feature of West European politics, and since the mid-1980s, immigration has been the most important issue for them. Recent research has linked the levels of support these parties receive to polity-level variables such us unemployment and immigration. However, comparative micro-level evidence on the motives of their voters is still scarce. Using recent survey data and a more appropriate measurement model than previous research, this article has demonstrated that Kitschelt’s 1995 hypothesis about the importance of neo-liberal policy preferences is not borne out in practice, and that the role of “pure protest” motives is very limited. Rather, the Extreme Right vote is driven by intense feelings of anti-immigrant sentiment in all countries but Italy. In line with theories of ethnic group conflict, these feelings are particularly strong within those segments of the electorate that compete with immigrants for scarce resources (low paid jobs and welfare benefits). While the effects of anti-immigrant sentiment are strong, they are, however, moderated by general ideological preferences and party identification. On the basis of a new data set and a richer statistical model, these findings therefore confirm earlier claims that the Extreme Right vote can be explained by general causal mechanisms that apply to other parties, too (van der Brug and Fennema 2003). More specifically, the Extreme Right vote can be understood as the result of long-term political preferences and affiliations on the one hand and (immigration) policy-related attitudes on the other.21 Once these standard variables are measured adequately, it seems largely unnecessary to consider static22 and idiosyncratic factors like personality traits (Adorno et al. 1950) or alienation in today’s mass society (Kornhauser 1960). Rather, comparative electoral research should focus on the specific circumstances under which immigration is politicised and perceived as a problem that can move votes. Arzheimer, Kai. 2002. Politikverdrossenheit. Bedeutung, Verwendung und empirische Relevanz eines politikwissenschaftlichen Begriffes. Wiesbaden: Westdeutscher Verlag. Arzheimer, Kai. 2008. Die Wähler der extremen Rechten 1980-2002. Wiebaden: VS Verlag für Sozialwissenschaften. Arzheimer, Kai and Elisabeth Carter. 2006. Political Opportunity Structures and Right-Wing Extremist Party Success. In: European Journal of Political Research, 45: 419–443. Betz, Hans-Georg. 2003. The Growing Threat of the Radical Right. In: Merkl, Peter H. and Leonard Weinberg (eds. ), Right-Wing Extremism in the Twenty-First Century, London: Frank Cass. 74–93. Beyme, Klaus von. 1988. Right-Wing Extremism in Post-War Europe. In: Beyme, Klaus von (ed. ), Right-Wing Extremism in Western Europe, London: Frank Cass. 1–18. Billiet, Jaak and Hans de Witte. 1995. Attitudinal Dispositions to Vote for a ‘New’ Extreme Right–Wing Party: The Case of ‘Vlaams Blok’. In: European Journal of Political Research, 27: 181–202. Clark, John A. and Jerome S. Legge. 1997. Economics, Racism, and Attitudes toward Immigration in the New Germany. In: Political Research Quarterly, 50: 901–917. Garson, David. 2008. Structural Equation Modeling. www2.chass.ncsu.edu/garson/pa765/structur.htm(21.05.08): College of Humanities and Social Sciences, North Carolina State University. Golder, Matt. 2003a. Electoral Institutions, Unemployment and Extreme Right Parties. A Correction. In: British Journal of Political Science, 33: 525–534. Golder, Matt. 2003b. Explaining Variation in the Success of Extreme Right Parties in Western Europe. In: Comparative Political Studies, 36: 432–466. Hainsworth, Paul. 1992. Introduction. The Cutting Edge. The Extreme Right in Post-War Western Europe and the USA. In: Hainsworth, Paul (ed. ), The Extreme Right in Europe and the USA, London: Pinter. 1–28. Hotelling, Harold. 1929. Stability in Competition. In: The Economic Journal, 39: 41–57. Ignazi, Piero. 2002. The Extreme Right. Defining the Object and Assessing the Causes. In: Schain, Martin, Aristide Zolberg and Patrick Hossay (eds. ), Shadows Over Europe. The Development and Impact of the Extreme Right in Western Europe, New York: Palgrave. 21–37. Jackman, Robert W. and Karin Volpert. 1996. Conditions Favouring Parties of the Extreme Right in Western Europe. In: British Journal of Political Science, 26: 501–521. Kang, Won-Taek. 2004. Protest Voting and Abstention Under Plurality Rule Elections: An Alternative Public Choice Approach. In: Journal of Theoretical Politics, 16: 79–102. Kaplan, David. 2000. 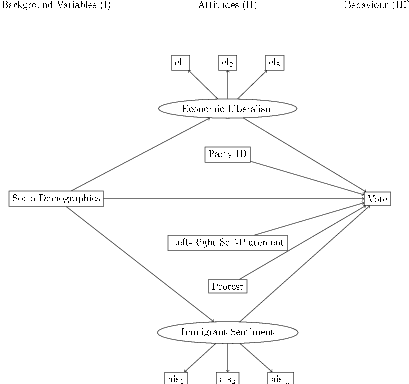 Structural Equation Modeling. Foundations and Extensions. Thousand Oaks: Sage. King, Gary, Michael Tomz and Jason Wittenberg. 2000. Making the Most of Statistical Analysis. Improving Interpretation and Presentation. In: American Journal of Political Science, 44: 341–355. Knigge, Pia. 1998. The Ecological Correlates of Right-Wing Extremism in Western Europe. In: European Journal of Political Research, 34: 249–279. Kornhauser, William. 1960. The Politics of Mass Society. London: Routledge and Kegan Paul. Kriesi, Hanspeter. 1999. Movements of the Left, Movements of the Right: Putting the Mobilization of Two New Types of Social Movements into Political Context. In: Kitschelt, Herbert, Peter Lange, Gary Marks and John D. Stephens (eds. ), Continuity and Change in Contemporary Capitalism, Cambridge: Cambridge University Press. 398–423. Lipset, Seymour Martin and Stein Rokkan. 1967. Cleavage Structures, Party Systems, and Voter Alignments. An Introduction. In: Lipset, Seymour Martin and Stein Rokkan (eds. ), Party Systems and Voter Alignments. Cross-National Perspectives, New York/London: Collier-Macmillan. 1–64. Lubbers, Marcel, Mérove Gijsberts and Peer Scheepers. 2002. Extreme Right-Wing Voting in Western Europe. In: European Journal of Political Research, 41: 345–378. Mair, Peter and Cas Mudde. 1998. The Party Family and Its Study. In: Annual Review of Political Science, 1: 211–229. Mayer, Nonna and Pascal Perrineau. 1992. Why Do They Vote for Le Pen? In: European Journal of Political Research, 22: 123–141. McGann, Anthony J. and Herbert Kitschelt. 2005. The Radical Right in The Alps. Evolution of Support for the Swiss SVP and Austrian FPO. In: Party Politics, 11. Mudde, Cas. 1996. The War of Words. Defining the Extreme Right Party Family. In: West European Politics, 19: 225–248. Mughan, Anthony and Pamela Paxton. 2006. Anti-immigrant sentiment, policy preferences and populist party voting in Australia. In: British Journal of Political Science, 36: 341–358. Newell, James L. 2000. Italy. The Extreme Right Comes in from the Cold. In: Parliamentary Affairs, 53: 469–485. Poguntke, Thomas and Susan E. Scarrow. 1996. The Politics of Anti-Party Sentiment: Introduction. In: European Journal of Political Research, 29: 257–262. Royston, Patrick. 2005. Multiple Imputation of Missing Values. Update of ice. In: The Stata Journal, 5: 188–201. Rubin, Donald B. 1987. Multiple Imputation for Nonresponse in Surveys. New York: John Wiley & Sons. Rydgren, Jens. 2005. Is Extreme Right-Wing Populism Contagious? Explaining the Emergence of a New Party Family. In: European Journal of Political Research, 44: 413–437. Swank, Duane and Hans-Georg Betz. 2003. Globalization, the Welfare State and Right-Wing Populism in Western Europe. In: Socio-Economic Review, 1: 215–245. Swyngedouw, Marc. 2001. The Subjective Cognitive and Affective Map of Extreme Right Voters: Using Open–ended Questions in Exit Polls. In: Electoral Studies, 20: 217–241. van Buuren, Stef and Karin (CGM) Oudshoorn. 1999. Flexible Multivariate Imputation by MICE. http://web.inter.nl.net/users/S.van.Buuren/mi/docs/rapport99054.pdf (07.10.2005). van der Brug, Wouter and Meindert Fennema. 2003. Protest or Mainstream? How the European Anti-Immigrant Parties Developed into two Separate Groups by 1999. In: European Journal of Political Research, 42: 55–76. van der Brug, Wouter and Meindert Fennema. 2007. Causes of Voting for the Radical Right. In: International Journal of Public Opinion Research, 19: 474–487. Weakliem, David L. 2002. The Effects of Education on Political Opinions. An International Study. In: International Journal of Public Opinion Research, 14: 141–157. 1Endless debates not withstanding, there is still no agreement as to what is the most appropriate terminology. In practice, however, this has not hampered scientific progress. As Mudde (1996: 233) observes, “we know who they are, even though we do not know exactly what they are”. In the remainder of this paper, I shall use “Extreme Right” as a shorthand for the Austrian Freedom Party, the Flemish Vlaams Blok/Vlaams Belang, the French-speaking Belgian Front National, the Danish People’s Party and the Danish Progress Party, the French Front National and the Mouvement National Républicain (MNR), the Italian Alleanza Nazionale, Lega Nord and Movimento Sociale-Fiamma Tricolore, the Dutch Lijst Pim Fortuyn (LPF), and the Norwegian Progress Party, simply because it is the most common label for these parties. 2An attempt at a slightly stricter definition of the Extreme Right would involve three elements: i) while their economic policies are quite flexible and of lesser importance, parties of the Extreme Right take a tough stand on immigration and do often (though not always) take a “right” position with respect to many other issues that form the authoritarian-libertarian dimension of political conflict, ii) in terms of political style and patterns of co-operation with other parties within their respective political system, they are usually not well integrated and present themselves as outsiders or radical alternative to the established parties and elites, and iii) although they may be “extreme” in these respects, they are not necessarily “extremist”, i.e. beyond the liberal-democratic pale (see Arzheimer 2008 for a more elaborate discussion of these issues). While this definition still leaves considerable room for interpretation, in reality there is hardly any disagreement amongst scholars as to which parties belong to the Extreme Right family (Mudde 1996). 3While the Swiss SVP is often considered as a party of the Extreme Right, Switzerland was excluded because its institutional structure is vastly different from other West European countries and because until recently, the transformation of the SVP was confined to the so-called “Zurich wing” of the party. 4While the Extreme Right in Germany is slightly stronger than in Spain or the UK, Germany had to be excluded from this analysis because of the very low number of self-confessed supporters of the Extreme Right in the German part of the ESS. 5Following a well-established convention, latent variables are represented by ovals in Figure 1. Observable variables are represented by rectangles. 6From the information in the ESS, a simplified version of the Goldthorpe scheme (which is widely used in comparative research) was derived. 7The ESS team provides a scale of educational attainment that greatly facilitates international comparisons. 8The latter two variables – single person households and having/not having a partner – reflect notions of social isolation that are prominent in the older literature on right-wing extremism. Church attendance and union membership are primarily included as controls for the effects of traditional West European cleavages (Lipset and Rokkan 1967) but can also be interpreted as indicators for social integration. 9The variable was coded as trichotomous: identification with a party of the Extreme Right vs. identification with some other party vs. no identification at all (the reference category). 10Assertions about causality in non-experimental settings are always problematic. However, while variables in block I (socio-demographics) can clearly have a causal effect on the attitudes in block II (via socialisation and other processes of attitude formation), it is difficult to conceive of a process through which attitudes would affect socio-demographics. Similarly, the vote cannot possibly have a causal effect on socio-demographics. A causal effect of past behaviour on present attitudes via some sort of cognitive rationalisation process cannot be ruled out completely, though it seems unlikely that this would be a huge problem here. 11All models were estimated with MPlus 4.0, which provides estimators for both logit and probit links. Here, the latter was chosen because it is computationally much more attractive. 12Throughout this paper, the conventional five percent threshold is used. 13In Austria, the sign is correct but the effect is rather weak (though statistically significant). In Denmark, Italy, the Netherlands and in Norway, the parameter is not significantly different from zero. In Belgium and France, there is a weak but statistically significant effect that has the wrong sign. 14Because the number of Fiamma Tricolore and Lega Nord voters is very small (13), it is not possible to differentiate between them and the Alleanza voters. 15For simplicity’s sake, the other independent variables can be ignored since their effects are not significantly different from zero. 16The results refer to Norway but would be broadly similar for other countries. The values of 4, 7 and 5 for ideology reflect the lower quartile, upper quartile and median of the empirical distribution. 17The overall probability of a Freedom Party vote is rather high. This reflects the fact that the Freedom Party attracted more than 20 per cent of the vote in the Storting election of 2005. 18Empirically, the number of left-leaning, pro-immigrant Freedom Party identifiers is of course rather limited. 19The two latent variables are scaled so that a value of 0 is equivalent to the national average (see section 2). A value of +/-1 is one standard deviation above/below the national average. 20The calculations for Table 10 are based on the estimate for the respective coefficient in Table 9 (-0.035). However, the t-test test indicates that there is insufficient evidence (at the five per cent level) to reject the hypothesis that the coefficient is exactly zero. If one is willing to take the result of the test at face value, the ratio in Table 10 would be exactly 1. 21Presumably, candidate orientations are important, too, but these can not be measured with the data at hand. 22The (somewhat crude) indicators for alienation/social integration that are included in the model – household size, marital status, church attendance and union memberships – display few substantial effects in Tables 7, 8 and 9. The ESS questionnaire (like most other surveys) contains no indicators for personality traits, but the very notion of a disposition that is stable over decades is difficult to reconcile with the fluctuations of Extreme Right support in Western Europe. For a more comprehensive discussion and test of the traditional explanations of right-wing support in Western Europe see Arzheimer 2008.